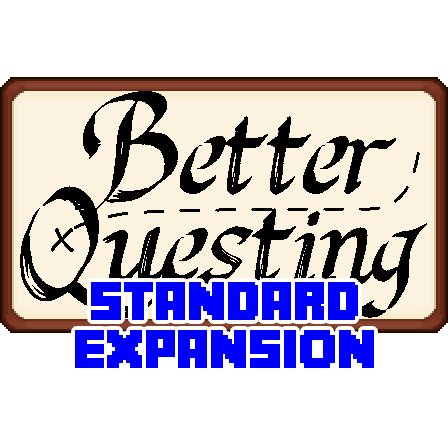 Contains a handful of tasks, rewards, importers and themes to get you started using BetterQuesting. Also contains hand held loot chest reward items with tiered levels. How do I go about adding NBT to items? Struggling to work it out. Trying to work with QuesstUtils pedestals, used by Modern Skyblock 3 as trophy rewards. but I can't work out how this information was added via the questbook as part of the reward. When editing quests, next to item entries there will be a button labelled "...". Click this and then click "Raw NBT". Here you will be able to browse and edit the NBT structure of the item however you need. I don't use the JSON formatting vanilla Minecraft does because it's not the same format as what is used to write to files (manual editing can cause corruption should the two interfere with one another). It's also slower to convert back and forth at runtime and doesn't compress as well. I am having issues with editing the quests. When I am designing the icons, when ever I zoom in or out or drag the screen so I can move the icons, the game crashes. The mod doesn't seem to be working. I have better questing installed as well but i don't have any quests showing up. Do I have to type in a command or something? I tried typing all the commands added by the mods but I still don't have quest. BQ doesn't come with any built in quests. That's up to the pack developers to write them into the pack. Is there any way to get a bunch of premade quest? i'm making my own modpack for me and a few friends but I don't want to spend a bunch of time making quest by hand. Is there anywhere where I can view the list of console commands that can be activated via a quest reward? Literally any valid command from any mod should work although I highly discourage any that modifies the questing database such as "/bq_admin default load" because that could cause concurrency issues and possible corruption. When I try to open I get the loading error that I need the"betterquesting" dependency. Does this Standard Expansion not include it? If not where can I find it, it's not under dependencies. Honestly, I'm just too lazy to set the dependency info every time I upload a new version because Curse doesn't let me set it as the global default for the project as a whole. Plus, it usually only takes a quick mod search on Curse Forge to find the base mod. Thank you! Funny, when I was searching for it earlier it didn't seem to show up and when it did, I was directed to an error page. But your link works! So thanks again! Any way to remove the excess information? I'll remove them outside of edit mode but they are part of the advanced tooltips (F3 + H). ahh... well than.. on the other side if you are not in edit mode you don't really need that information. /bq_admin default load Doesn't work, says 'Database not found' How to use it? You need to have saved a default quest line before you can load one. 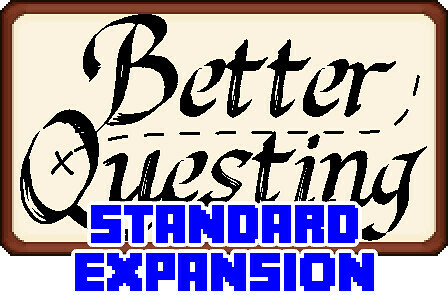 BQ doesn't come with any quests out of the box and it's up to the pack dev to write them. I mean not BQ itself, but standard expansion, isn't it supposed to include some tasks? No, sorry. Expansions are there to extend the options pack developers have at their disposal for designing quest lines themselves using the included editors. For example, RF Expansion includes parts for setting up power delivery based tasks while NPC Integration allows BQ to hook into Custom NPCs own RPG systems. None of these include any pre-made quest lines. That said, I just added a new command in Standard Expansion 3.4.149 that can dump the vanilla advancement tree to quest lines. It doesn't make use of the majority of BQs capabilities but it's nice if you need something quick for reference. Hi, i got got this mod along with the questbook and the better questing. I cant see any of my quests. is there a config option that can fix this?